Stylish, attractively priced and incredibly comfortable. The fashion sensation from the USA: Plaited sneakers by bernie mev. from New York, the “Master of woven footwear”. 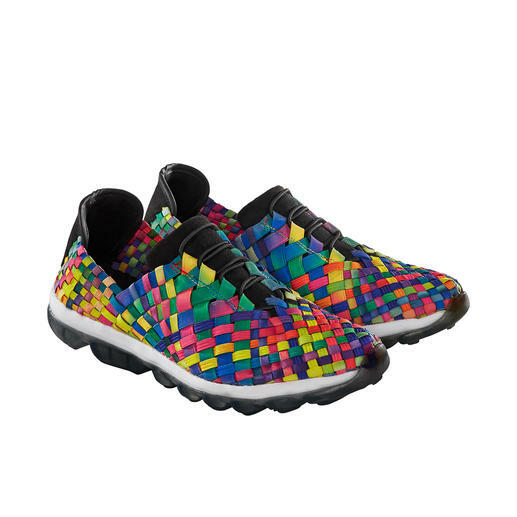 Fashionable sneakers that cannot get any more comfortable, lightweight and airy. Even though they have been around for more than 40 years, it’s only since the sneaker and sportswear hype started that the casual plaited shoes by bernie mev. New York have become a focal point of fashion magazines and fashion bloggers. The airy, woven elasticated straps resemble basket weave and provide extreme flexibility and breathability. With the cushioning sole made of viscoelastic memory foam you will feel like you’re walking on air. The shoes yield to the shape of your feet and the pressure of every movement. Upper, lining and insole: Textile. Outer sole: Rubber. Colour: Multicoloured. Exclusive by Fashion Classics.